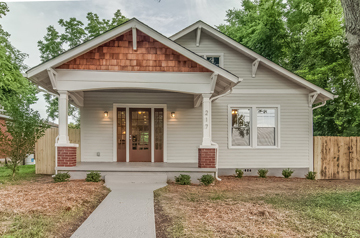 Most homes in the Woodbine neighborhood in the southeastern region of Nashville are under the $150,000 mark. Anchored by a community center geared toward youth activities such as after school tutoring and English-as-Second-Language camps, Woodbine is an area dominated by the residential sector with a smaller business hub than some of the other neighborhoods. A mix of apartment buildings and row houses exist here but single-family homes predominate. The social scene in Woodbine is constantly updating. Flatrock Café features a coffee and sandwich shop through the week as well as live music and buckets of beer on nights and weekends. Menu items are named after streets in the Woodbine neighborhood, such as the pimento cheese sandwich the Wingate. A Farmer’s Market opened here in June, 2010 to sell locally grown produce, cheeses, and meat, and has become a favorite stop for many of Nashville’s most delicious street food vendors. Cool restaurant and music venue 3rd and Lindsley hosts local acts as well as big names such as Train and Bella Fleck.Learn more about the Woodbine Neighborhood and its Real Estate Market here.